As well as conveying a message in words and sounds, the speech signal carries information about the speaker’s own anatomy, physiology, linguistic experience and mental state. These speaker characteristics are found in speech at all levels of description: from the spectral information in the sounds to the choice of words and utterances themselves. This chapter presents an introduction to speech production and to the phonetic description of speech to facilitate discussion of how speech can be a carrier for speaker characteristics as well as a carrier for messages. 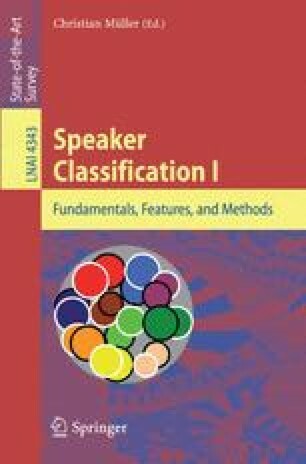 The chapter presents an overview of the physical structures of the human vocal tract used in speech, it introduces the standard phonetic classification system for the description of spoken gestures and it presents a catalogue of the different ways in which individuality can be expressed through speech. The chapter ends with a brief description of some applications which require access to information about speaker characteristics in speech.